You may remember me blogging about the Biscuit Love truck that used to frequent the Franklin Farmer's Market last year. 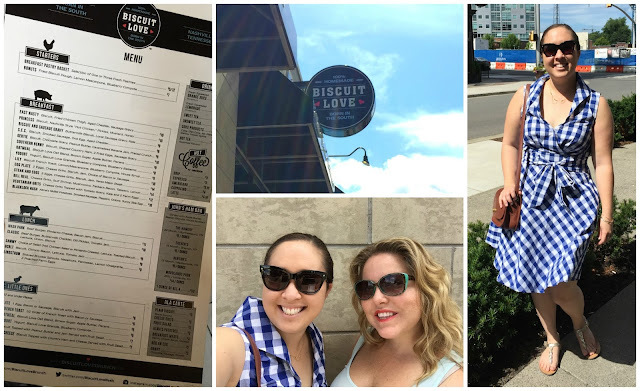 Now, Karl and Sarah Worley have taken their biscuits (and more) to a brick-and-mortar Biscuit Love restaurant in the Gulch (next to Bar Louie) with a line out the door! It opened last fall, but it took me that long to get up to Nashville (vs. rolling out of bed to the Farmer's Market down the street) to brave the lines to give the place a try. Luckily, my friend Anna was in town so it gave us an excuse to head north for brunch, my favorite meal of the day. Like any Nashville hot spot, there's a line. We expected as much on Sunday morning, especially given it was CMA Fest weekend! We arrived around 10am I believe, and we were a little nervous about the number of people ahead of us. We were able to browse menus while we waited, as you stay in line as you move inside (and order at the counter) before receiving a number and being loosely directed towards available tables. Me and Anna... Dan is camera shy LOL. Also, new dress! I feel like we didn't have to wait long at all, because a lot of the groups were large and being a party of three we were ushered forward as tables opened up. The bar is first-come, first-served I believe, but be sure to ask a hostess/server checking on the line! Once we'd ordered, we were served quite quickly! Anna had a Bloody Mary and Dan had a craft beer. I needed caffeine so I had a delicious Arnold Palmer. Anna treated us to my favorite part of the meal... BONUTS. 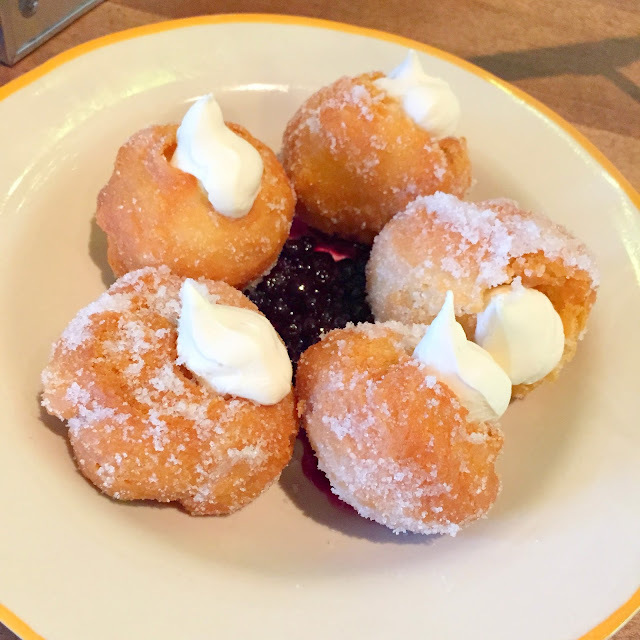 Fried biscuit dough (AMAZING) with sugar, lemon mascarpone, and blueberry compote. I seriously think that when I come back, I will make this my main meal, so I can have them all for myself. My. new. favorite. thing. I had a lot of trouble making up my mind for my main dish, because the menu at the restaurant is much more extensive than the truck's used to be. I decided that for my first visit, I needed to go with my old truck standby, the SEC: biscuit, smoked sausage, egg, and aged cheddar. I had the egg scrambled because I was in the midst of sensory overload when I ordered; I usually prefer the egg fried. But it was delicious nonetheless! Even better than the truck days, honestly... although I wonder if it's because I was eating it in air conditioning at a table with real silverware vs. plastic fork at the market. I also ordered sides of the "chronic" bacon which was sticky and sweet, and the potatoes. The potatoes I wish were a bit crispier, but the bacon was fab. Bacon purists might prefer the normal bacon, but I love a little sweetness with the salt. 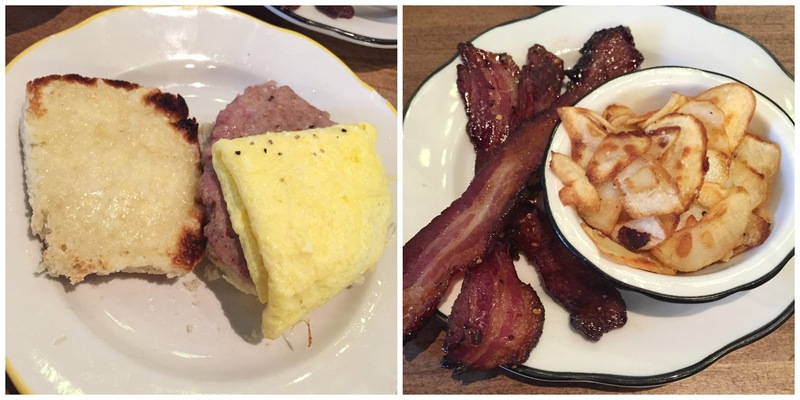 You guys, do yourself a favor and hit up Biscuit Love... I'm so glad I could take my friend Anna (and Dan, too!) to brunch there, and to meet Karl. I'm so happy for the Worleys and this new adventure, and hoping they put another location in Franklin someday!